Immersion Coolers model “ET : The evaporator coils can be simply immersed in Coolant Tanks and cooling is by direct contact with the liquid. The compact design occupies minimum space. A fully Hermetic Compressor incorporated. Very ideal when liquids are highly contaminated and corrosive in nature. Ranges available form 900 to 15000 kcal/Hr. We deals in Delhi / NCR only. Ultra Low Immersion-Cooler Suitable For Low Temperature Organic Synthetic Reaction's. As Well As Useful For Low Temperature Application's. Recirculating-Cooler / Refrigerated & Heating Circulator's For Internal & External Application's. FROM AMBIENT +5°C TO 100°C / 200°C. TEMPERATURE CONTROLLED THROUGH MICROPROCESSOR BASED PID TEMPERATURE CONTROLLER HAVING MEMBRANE KEYPAD WITH SOFT TOUCH SWITCHES. COOLING CAPACITY: 155 WATT @ -80 DEG C.
SUPPLY COMPLETE ALONG WITH VACUUM INSULATED VESSEL. 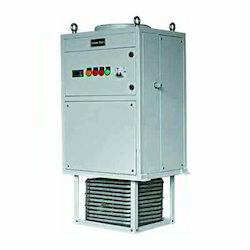 JULABO Immersion Coolers are primarily used for counter-cooling when connected to a heating circulator, or for rapidly cooling fluids down to low temperatures. Take advantage of the space-saving design. JULABO Immersion Coolers represent an economical alternative to conventional tap water cooling. 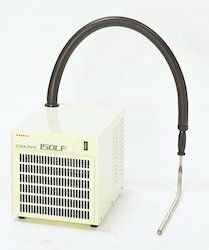 The easy-to-use units are suitable for a variety of cooling applications.